You'll be £19.99 closer to your next £10.00 credit when you purchase Madness, Murder and Mayhem. What's this? Specific case studies are used to illustrate and describe some of the earliest patients at Broadmoor Hospital – the Criminal Lunatic Asylum for England and Wales and the Criminal Lunatic Department at Perth Prison in Scotland. Chapters examine the mental and social problems that led to crime alongside individuals considered to be weak-minded, imbeciles or idiots. Family murders are explored as well as individuals who killed for gain. An examination of psychiatric evidence is provided to illustrate how often an insanity defence was used in court and the outcome if the judge and jury did not believe these claims. Two cases are discussed where medical experts gave evidence that individuals were mentally irresponsible for their crimes but they were led to the gallows. Written by genealogists and historians, this book examines and identifies individuals who committed heinous crimes and researches the impact crime had on themselves, their families and their victims. A fantastically intriguing and insightful read, the pages of this book are filled with information that has been thoroughly researched and collated by two experienced and respected historians and genealogists. I think it would be fair to say that this book was a great starting point for me wanting to know more about asylums and health care in the 1800s in Britain, especially after reading chapters about the creation of specific facilities for the treatment of those deemed criminally insane. The case histories used in each section of the book make for fascinating reading, and it's interesting seeing how society and medical professionals saw and understood those who had mental illness or committed crimes because of mental illness. The sections on mentally weak habitual criminals and idiots and imbeciles really opened my eyes and had me asking so many questions after reading the case histories. The ideas at the time were often that poor parenting and poverty were the cause of some mentally weak people. A former governor and medical officer of Holloway Prison commented 'some criminals are of bad or degenerate stock' and 'different to skilled criminals who would not have recruited associates of low intelligence', and I do think that this is a very powerful way to see people. The arguments that took place at the time of how to define individuals makes for interesting reading, and it was often felt that it would be in infringement to lock people up because of what was deemed to be a low intellect. Which was in contrast to those who were of the belief that segregation and strict birth control would contain those with learning disabilities. Alarming really when you consider the views of the Eugenics Education Society at the time. The theme of poverty is covered along with infirmity and illegitimacy, which involved societal issues such as employment, sickness and disability. These were contributors to the break down of families and often lead to families being admitted to workhouses. However, fear of workhouses was catalyst enough for many, these 'prisons for the poor' were to be avoided and so many would descend into a spiral of poor mental health trying to keep themselves away from the workhouse and keep their families clothed, homed and fed. An absolutely fascinating read and one I would highly recommend! A well-written account on the background of how mental health was treated in years gone by. A difficult one for me as my mum was a sufferer although she had not committed a crime she was not treated well. This book depicts the treatment of the accused who were deemed unfit to plead and retained at Her Majesty's pleasure. Recommended reading. Overall a really interesting read. It is an interesting read and, although there is no specific advice for family historians, it provides a good introduction to many of the issues relating to mental health and criminality in the Victorian era. The book describes the background of various institutions, how mental health has been veiwed and how patients were treated in the past though a number of different cases a number of cases. These cases are mostly based around acts of violence or cases of murder where the perpetrator has been found incapable of making a plea to the charges against them therefore they have been declared insane and sent to various institutions to be detained at Her Majesty's pleasure. The book was written in a clear and uncomplicated manner I enjoyed it till the last few chapters when I found it started to become repetitive. This is only my opinion and does not mean to say that somebody else would not find in it interesting and enjoyable read. 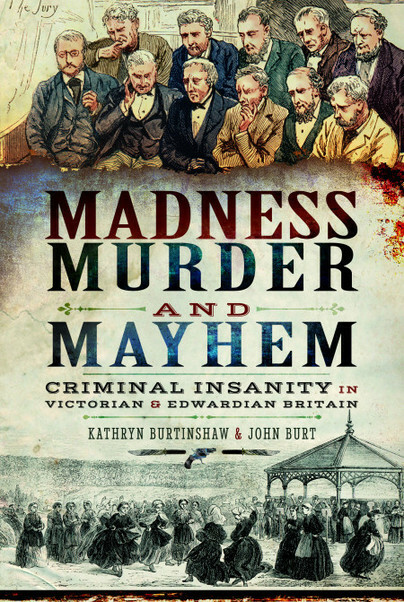 The book takes a look at the development of mental illness, crime, and the law in Victorian & Edwardian Britain. With sections including parricide, infanticide, and children killing children (in a case strangely reminiscent of the James Bulger case), it was a fascinating read and it has made me interested in learning more about the subject. It was especially interesting to read a different narrative about Victorian asylums. Too often the vision of the horrors portrayed in films and TV programmes takes over, whereas it seems from the evidence presented here, that there was a conscious effort by many to treat those with mental illness in a more compassionate way. I’m interested in the history of mental health issues and how the mentally ill were treated historically. During the nineteenth century changes in attitudes towards the mentally ill, and disabled people generally, started to change, and the nascent psychiatric and psychological disciplines of medicine emurged with the ‘alienist’ and the ‘mad doctor’. At a time when viable treatments was non-existent, families, institutions and communities had the burden of care for the sick. But what about those who committed crimes while mentally ill? This book covers the subject, using biographies of ‘criminal lunatics’ and those detained at the monarch’s pleasure because they were found not guilty by reason of insanity but were also considered too dangerous to be out in society. It was during this time that Broadmoor was opened and its medical superintendents were considered to be experts in mental illness and the care of their patients/prisoners. During the nineteenth century doctors started to be called on as expert witnesses in trials where possible insanity was a cause. Many deemed insane were locked up, either for a fixed term, until deemed well or for life. Some were let out on licence only to kill because they were not cured, and some were still hanged, despite evidence of insanity. The biographies of those covered in this book were interesting and sympathetically written, using contemporary sources and the change in attitudes from 1812 to 1912 are obvious. Medical care changed from manacles to keeping busy in a calm environment, although treatment and understanding of the causes was still lacking, awaiting scientific advances. Such a pity that sanism and ableism is still alive and well over a century later. A good book for those with an interest in the 19th century and its social attitudes, and those interested in the history of mental illness in Britain. This is a a thorough and interesting account of the origins of secure hospitals in the UK. I did have some reservations about this book, only because the cover made it look a little like those 'cut and paste' regional crime books. It is broken into categories that make it a much more clear read - other books on the subject can wander around a little. It was a fascinating read and it has made me interested in learning more about the subject. The book was written in a clear and uncomplicated manner I enjoyed it till the last few chapters when I found it started to become repetitive. This is only my opinion and does not mean to say that somebody else would not find it an interesting and enjoyable read. A cohesive and useful account of the history of mental health treatment. Dr John Burt is a professional genealogist and family historian based in Edinburgh. A retired general medical practitioner, he has held a lifelong fascination in Scottish social history. He graduated in Medicine in 1983 and holds a M.Sc. in Genealogical, Palaeographic and Heraldic Studies from the University of Strathclyde. John was an honorary clinical tutor to the School of Medicine, University of St Andrews, 2010-2013. John specialises in medieval, military and medical records. Kathryn Burtinshaw is an experienced researcher who holds an Advanced Diploma in Local History from Oxford University and a M.Sc. in Genealogy, Palaeography and Heraldry from the University of Strathclyde. Kathryn runs her own genealogy company, Pinpoint Ancestry, and lives in North Wales.